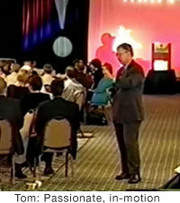 While poking around the web today I found previously unseen videos (unseen by me, that is) of three business presenters I've talked about here many times: Seth Godin, Guy Kawasaki, and Tom Peters. All three have extensive business experience in Silicon Valley (and a Stanford connection) and all three have great stories to tell and useful content to share. All three — no surprise — "get" the presentation thing and have worked to hone their style and improve their message and delivery over the years. If you watch the clips from the links below you'll notice that there is nothing traditional or conventional in their approaches to public speaking. Their respective styles are not exactly the kind of public speaking you'd see at your local Toastmasters meeting (an organization I highly respect and recommend, by the way). Still, it works for them. All three use slides in their talks; Guy no more than ten, Tom more than one hundred, Seth somewhere in between. The number of slides doesn't matter. What matters is that the visuals have an important role, but a supportive role. A complementary role. (1) Seth Godin. (See video clip.) Seth is a hot ticket, and an expensive one at that. I've read his books and get his story. But what a difference it is to see someone like Seth speak "his story" in a 40-minute presentation. It'd be much better live in person, but via video is not bad either. Books are great, but nothing beats seeing the person speak from his heart; the non-verbal communication adds so much. 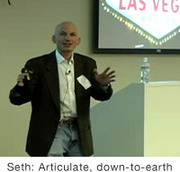 This 45-minute clip is of Seth speaking at Google earlier this year. 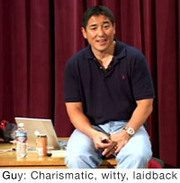 (2) Guy Kawasaki. (See video clip.) Guy here takes "Silicon Valley casual" to another level. I've seen Guy speak many times. He even did a few talks for me when I was at Apple. Audiences love him and appreciate his casual, frank style. In this short clip, Guy's so relaxed he's sitting on a desk. Depending where you are in the world, you may find his style "too casual." But for Guy, in his industry, it is appropriate. Both Guy and Seth have a relaxed, casual, "California style." Seth is a little more "professional" in appearance in his clip, but you'll notice he's still wearing jeans. The suit and tie may be appropriate in New York or London, but in Silicon Valley, wearing a suit and a tie is a good way to look like an outsider. Let me know what you think of these presenters (the good, bad, etc.) and please feel free to point me to some outstanding presenters we can see on-line. • Guy's demo video from his website. • Guy's "Art of the Start" presentation video at UCLA earlier this year. • Tom Peters on Presentations (Presentation Zen).